Green burial services are starting to occur with more frequency. Many people like the idea of a simple burial without embalming, like they did it in the "golden days" and some cemeteries and funeral homes are now offering these natural burial practices. The green natural type of burial is intended to cause minimal environmental impact by allowing the body to decompose naturally in the ground. The body is not embalmed and usually interred in a burial shroud or a biodegradable casket instead of a hefty hardwood or metal casket and concrete burial vault. Although green burial services are becoming more popular and common, not all cemeteries support or allow green burials and local availability should be verified before pursuing this option. In some areas, home funerals and burials may be an alternative to burial in a green cemetery; however, permits and minimum numbers of acres are generally required and local regulations should be checked. Once a location for the burial has been found, the next decision to be made is when the green burial service should occur. In most areas, when embalming is not performed the body of the deceased is required to be buried within 24 hours or kept refrigerated until the burial. If refrigeration is not desired or required then the funeral service must be arranged immediately; however, if refrigeration is used the funeral may be planned with more time, generally one week, and will allow for the possibility of a viewing of the deceased. 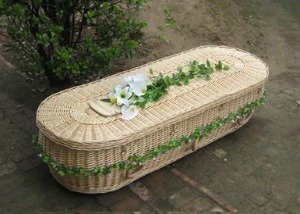 Once the timing of the green burial service is determined the funeral service can be planned. In keeping with the environmentally friendly theme of a green burial, the funeral service should also have low environmental impact. One way to ensure a more environmentally friendly funeral is to specify to friends and family that cut flowers should not be purchased or sent. Donations to charity or environmental groups may be made in lieu of flowers or donations to assist in planting of a living memorial tree may also be accepted. Many arboretums and gardens offer a living memorial service or the family may choose to plant a memorial tree at the family home. Another option that may be considered, especially if the deceased was active in the environmental service field, is to host a green service project as part of the memorial service. participate in a nationally or locally organized bird counting event. Many other options are available and local environmental groups can provide additional ideas and resources. A consideration when planning the funeral event is to decide if a reception will be held after the burial and if food or drink will be served. If refreshments or a meal will be part of the reception, every effort should be made to ensure that the food is from local providers in the spirit of the local food movement. If the local farmers market is in full production then a simple selection of fruits, vegetables, artesian bread and cheese can easily be served at the reception. Or catering service can be arranged from local restaurants who advertise their commitment to local or organic food. In addition to pursuing local food, the reception should avoid disposable products and should use sustainable items including cloth tablecloths and napkins, ceramic or glass plates and cups, and avoidance of bottled water. A recycling station should also be made available. Once the extent of the environmental theme has been decided, the actual funeral service can be planned. Calling family members to invite them to the funeral should also be done as soon as possible. While talking to them ask if they would like participate in the funeral service and how they would like to participate; be sure to communicate that the funeral will be environmentally friendly and the burial will be a natural burial. If a viewing is desired, schedule it for either the evening prior to the funeral service or immediately prior to the service. After the funeral service, a short graveside service is performed. This is usually reserved for family and close friends but it may be opened to all who attended the funeral if desired. Sometimes a religious blessing to dedicate the gravesite is performed with a few words from religious clergy or family member. Once the internment is completed, friends and family may adjourn to the reception or plan to meet for an environmental service project.